The Prime Minister's launch of the Digital India Campaign in 2015, gave a ray of hope to the country to be in league with the worldwide technological advancements. Following those footsteps, a Delhi-based FinTech Company, RealCash Technologies Limited, has emerged to carve a niche in the market of online payments. Being envisioned as a breakthrough venture to digitise India, RealCash Technologies Limited was found as a brainchild of Mr. Harshul Kaushik, Mr. Harsh Sharma, Mr. Devkaran Sharma and Mr. Hitesh Chhabra. The company and its founders have imbibed a vision-to enable Indian businesses operate in the most efficient and structured manner by using digital tools; irrespective of business nature, size and worth by creating a platform that reaches and benefits Indian consumers. Catering to this idea, the organization has generated more than 6,000 job opportunities and 500+ Channel Partner collaborations across India. For a nation which is 3.287 million sq. km huge and 1.31 Billion people strong, digitizing every nook and corner becomes a mammoth task. And for a mission to build a merchant network of 10 million businessmen in India by January 2022, the feasibility for partnerships of Channel Partners/Distributors becomes essential. To help reinforce the vision and mission of RealCash Technologies, the company appoints Channel Partners who reach out to merchants across various states and sub-cities. 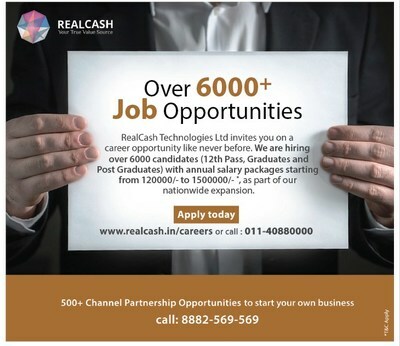 To help ease the process of reaching out to merchants, RealCash Technologies has opened its mass hiring campaign, targeted at expanding the career prospects of candidates with technical and non-technical backgrounds, thus ensuring the company's rapid expansion plan. While handling hiring of such vast numbers, RealCash Technologies has also leveraged more than 500 collaborative partnerships. The organization works with all of its Channel Partners on a revenue sharing model and has placed its focus on bringing lost businesses of local shopkeeper/retailers to a strong foothold by providing them technology used by big E-commerce giants at nominal costs. Hiring for this initiative revolves around candidates being shortlisted in almost all districts of the country, for RealCash-appointed Channel Partners, and for the resources the company requires on its payroll. Following the shortlisting, as and when a Channel Partner is appointed in a district, potential candidates are sent to the Channel Partners for final interviews for respective areas and domains. The company is currently aiming at opening job opportunities at PAN India level across domains like Area Sales Officer, Managers in Client On-Boarding, Accounts Executive, Inventory Executives, and more. Monthly salaries offered would range between INR 10,000 to 1.5 lakhs, all dependent on the job role applied for and designation of the joining employee. Candidates with experience, as well as fresh graduates, can look for career opportunities and can apply online through the careers page of RealCash's website: https://www.realcash.in. RealCash will run this campaign in collaboration with Helping Hands Charitable Trust, an NGO dedicated towards creating employment opportunities across India. HHCT will be shortlisting the candidates for RealCash & RealCash Channel Partners at PAN India Level. RealCash is a leading national provider of payment solutions for businesses. The company is built from the inside out, putting service at the centre of everything we do. We are a high-touch, high-tech, end-to-end system that delivers quality, value, and profitability to our customers and when our customers win, we win. RealCash Technologies Limited was incorporated in 2014. We are capable of supporting organizations of all levels, starting from a pavement shopkeeper to large corporate. We have come into existence to turn the Digital India dream into reality on a large scale. This can only be achieved when we take digitization to every nook and corner of our country.